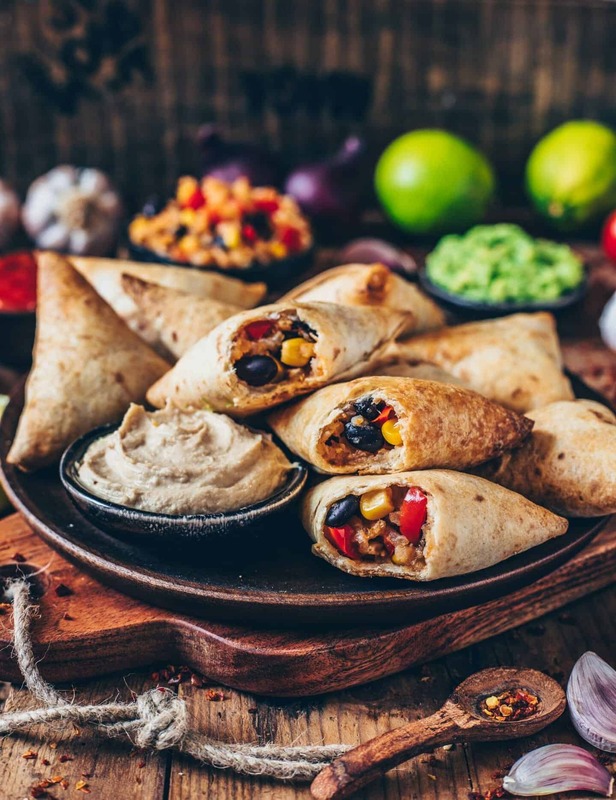 Vegan Burrito Samosas with a Mexican filling of rice, beans, corn and pepper. They are crunchy baked and a perfect snack for any occasion. This recipe is easy, gluten-free, healthy and delicious! 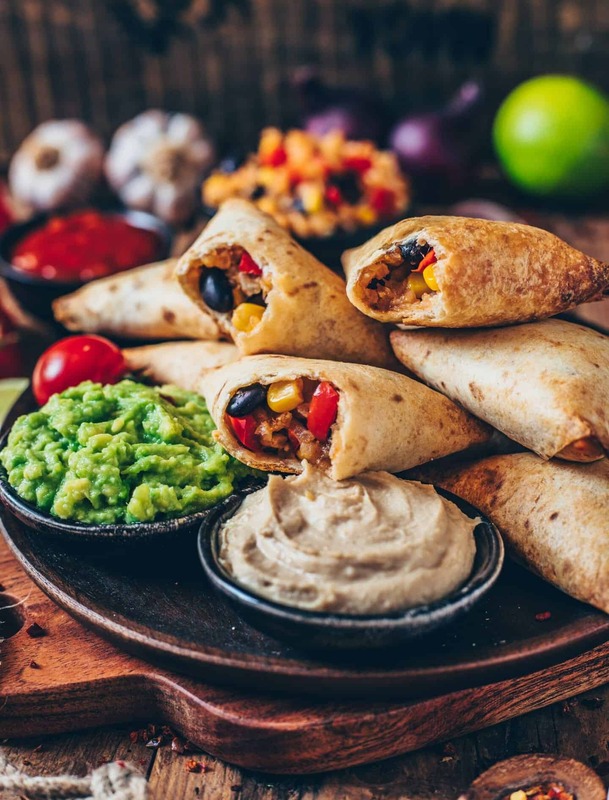 Burritos are one of my favorite dishes from Mexican cuisine. But somehow they are usually too big and too unwieldy for me. Maybe you know that problem, if everything falls out of the wrap 🙈. If you follow me on Instagram, you may have noticed that I prefer smaller practical finger food snacks such as Empanadas, Dumplings or Croquettes 😋. So I had the idea to fold the tortillas like Samosas by cutting the tortillas into four pieces to make small cones. I simply filled them with Mexican rice and baked them crunchy in the oven. That’s why I call them vegan Burrito Samosas. 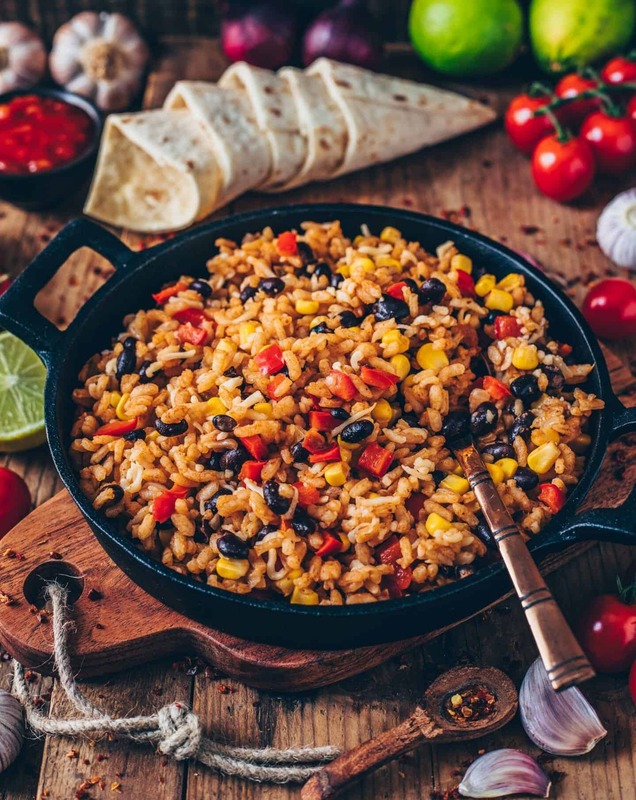 Mexican rice is very easy to make. You just need rice, beans, corn, peppers, onions, garlic and a few spices. I used risotto rice because it sticks together better and I also like sticky rice more. Of course, you can also use any other types of rice or maybe you even have Risotto or a rice stir-fry left over from the previous day. Basically, you can vary the filling however you like. 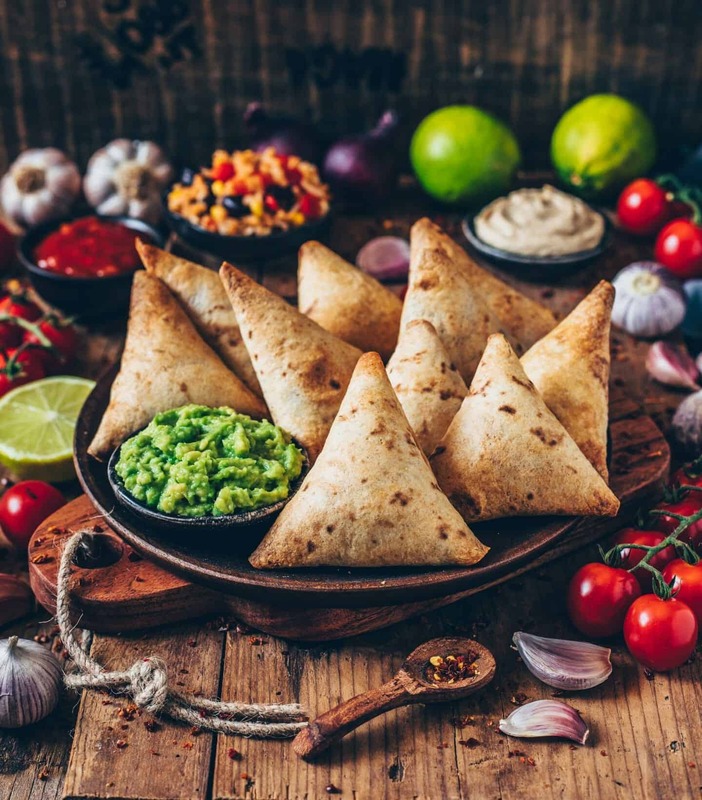 I’m sure these Tortilla Samosas tastes also super delicious with a classic Samosas filling made of potatoes, peas, carrots and Indian spices. To keep the Tortilla Samosas together, first mix some flour with a bit of water to make a thick, sticky paste. That’s like the glue. 2. Then you start with one quarter. Fold one corner towards the center. 3. Apply some paste on the sides of the opposite corner. 4. Fold the applied corner over it to form a cone and seal. 5. Add 1-2 tbsp of the filling. 6. Apply the open end with paste. 7. Fold up and seal. Of course, avocado should not miss when making Burritos! Not only is it super delicious, it also contains healthy fats and important vitamins, such as vitamin A, vitamin E and biotin. 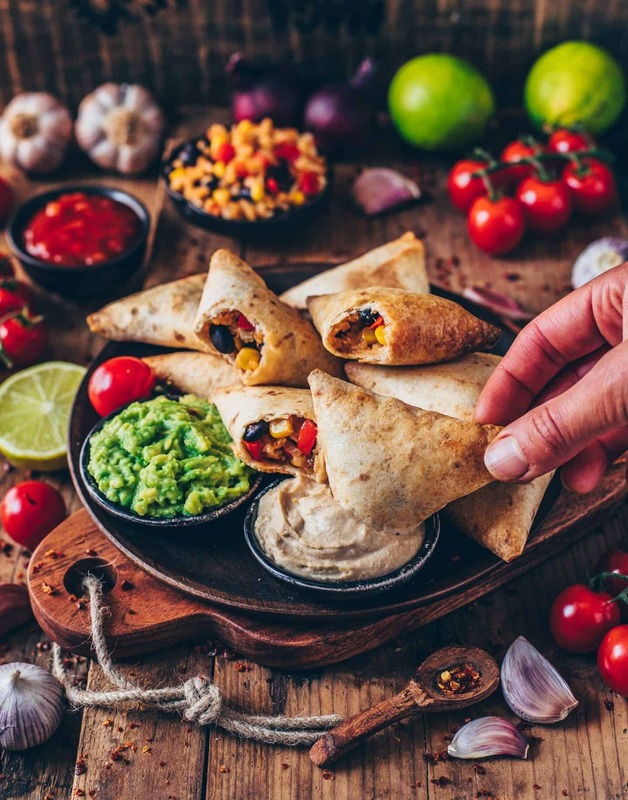 Therefore, I like to serve the vegan Burrito Samosas with a simple Guacamole. Also, I love serving a vegan cheesy dip made of cashews and seasoned with yeast flakes (optionally, you could also serve Hummus). 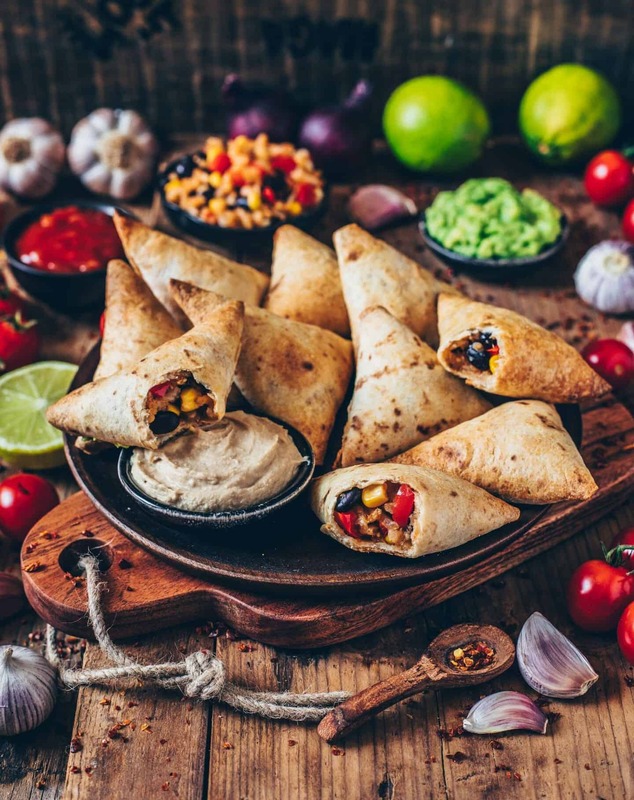 Plus a spicy tomato salsa dip with some chilli, the burrito combo is just perfect 👌🏻. Cook rice in salted water (or vegetable broth) according packaging instructions. Heat the oil in a skillet or pan and fry the onions briefly for 1-2 minutes. Add the garlic and paprika and stir-fry for a while, so that the peppers soften slightly. Then add smoked paprika, chili, cumin, salt and pepper and sauté briefly. Finally, stir in the beans and corn. Allow the Mexican rice to cool and then fold in the grated cheese. To make the flour paste (glue), mix flour and water in a small cup. Cut the tortillas into 4 pieces and fold each quarter (as shown in the video above) to a cone. Apply the outer sides with a little paste and seal. Fill the Tortilla Samosas with about 1-2 tbsp of Mexican rice (not too full, you should be able to close them easily). Apply the remaining open end with a little paste and fold up. Repeat this process until all ingredients are used up. 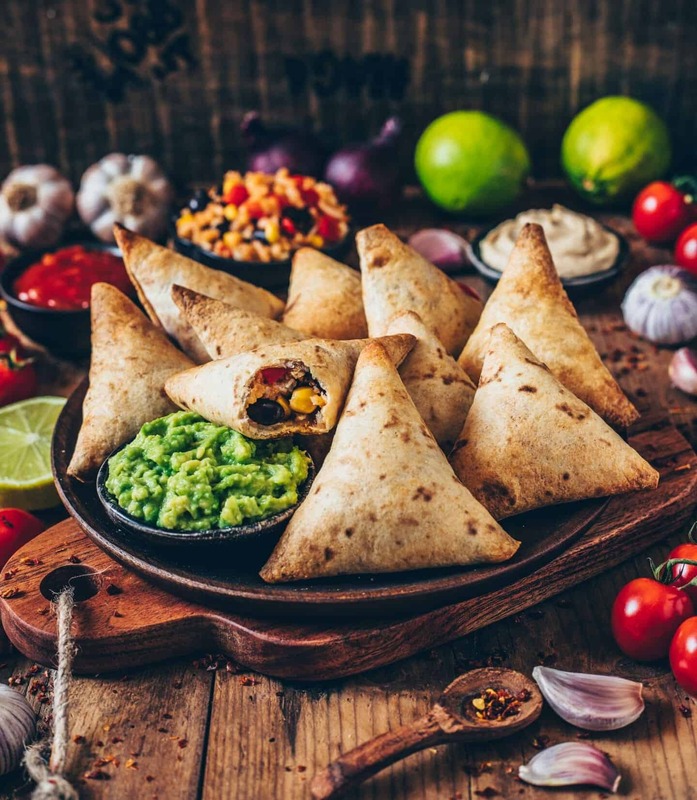 Place the Burrito Samosas on a baking tray lined with baking paper (the fold side down). Brush with a little almond milk + oil. Bake them in the preheated oven at 200℃ (392℉) for about 15 minutes (or until lightly browned and crispy on top). Halve the avocado, remove the core and puree with the remaining ingredients for the guacamole. Season to taste. Blend all the ingredients for the cashew dip. Season to taste. If you have not soaked the cashews overnight, you can also cook them soft for just 10-15 minutes. 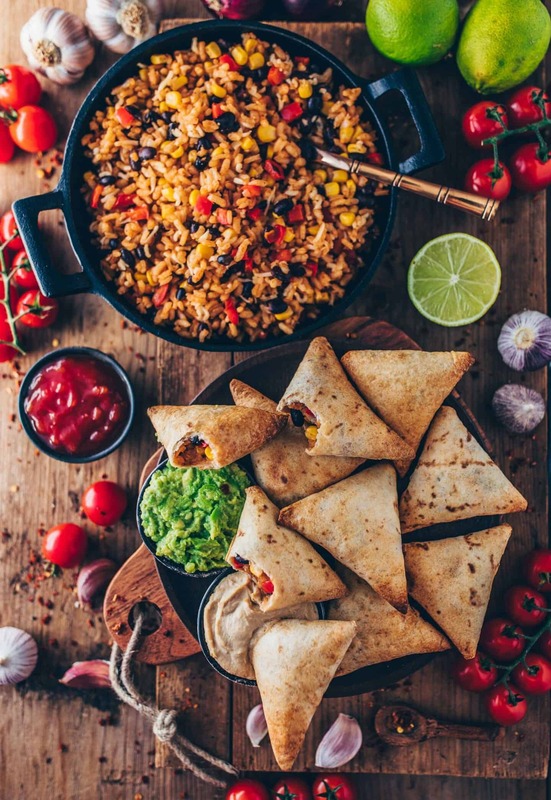 You’ll have some leftovers from the mexican rice, unless you’ve nibbled on some while preparing it 😋. ©biancazapatka.com | All images & content are copyright protected. Please do not use my images without prior permission. If you want to republish this recipe, please re-write the recipe in your own words, or link back to this post for the recipe. Thank you for supporting biancazapatka.com! These are AMAZING!! Bianca has the best recipes! Super quick and easy perfect for me cause I’m a MOM! My daughter loves them also and she’s a picky eater! This will definitely be going into my round of recipes! Thanks Bianca! The food was delicious, my whole family enjoyed it! What’s more the burrito is so easy and fast to make! Even though rolling the tortilla seemed pretty hard at first but it’s way easier than I thought. I recommend it with all my heart and I’m looking forward testing new recipes!! 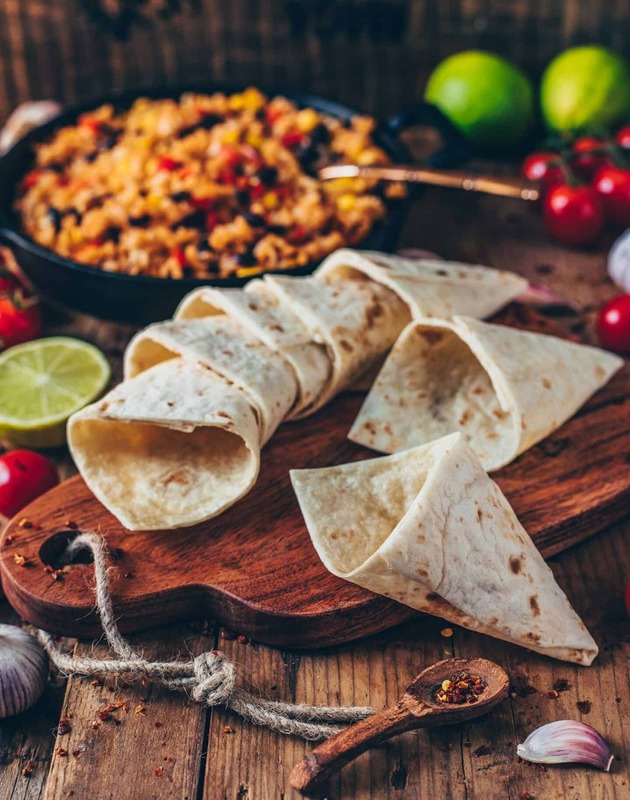 To make the tortillas softer, you can heat them up in the microwave or in a pan briefly before folding. I can’t get over how creative this is! 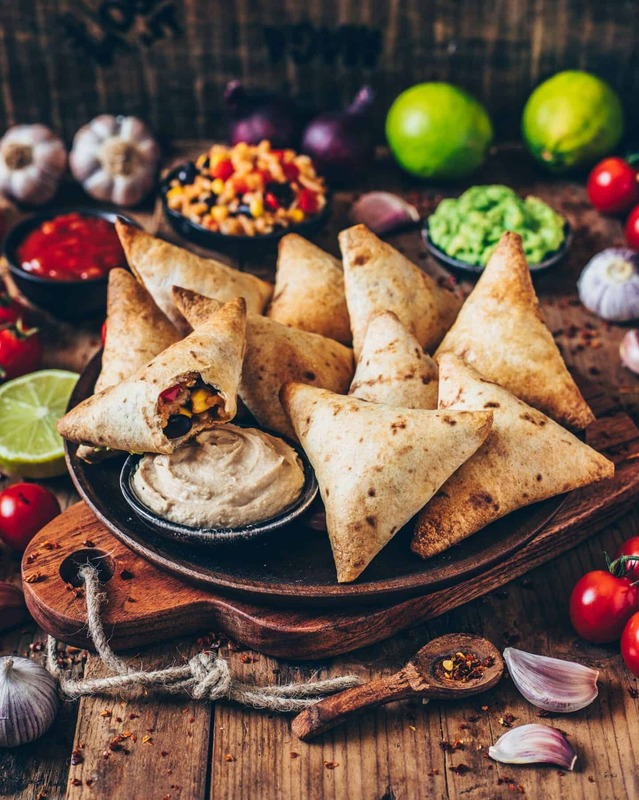 I love that you used tortillas to make “samosas.” So very creative and fun. Amazing idea, Bianca! It looks incredibly delicious. I wish this were in front of me. Danke, Bianca, dass du deine Rezepte mit uns geteilt hast. Ich liebe alles, was Sie tun, jedes Rezept scheint spektakulär zu sein, ich liebe es auch zu fotografieren, daher erscheinen mir Ihre Rezepte noch perfekter. Glückwunsch! 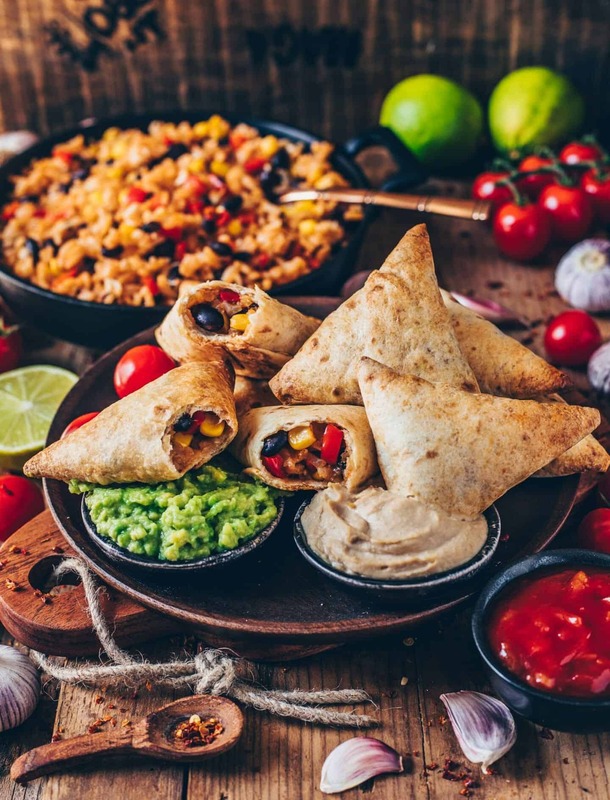 Ich habe Burritos Samosas vorbereitet und es ist eines meiner Lieblingsrezepte geworden. 10/10 dein Rezept. Das freut mich riesig! Ich danke dir! Hi there! Is the weight of the rice cooked or uncooked? Thank you. Found you via Instagram and this immediately grabbed my attention. Was an easy snack for a Sunday afternoon. The filling came out so delicious!!! Excited to try your other recipes! I'm Bianca, fitness and food passionate from Germany! Welcome to my little world of healthy treats and wholesome meals! I absolutely adore sharing my delicious and colorful food creations. You can find many beautiful inspirations on my blog and my Instagram page. Enjoy it and have fun! Newsletter - don't miss a thing!